Wheat (Triticum sativum Lam. = Triticum aestivum (L.) Thell) is a cereal of the Gramineae family, a family that also includes important cereals as rice, maize, oats, sorghum, etc. Wheat is an herbaceous annual plant up to 1.2 m in height. The stems are erect and present structure of cane, that is they are hollow inside except at the nodes. The growth of stems is not apical but produced by stretching of the tissues above the nodes (meristem). The leaves grow from the nodes. Like the rest of grasses, They have two parts: the petiole sheath that surrounds and protects the meristem and growth zone and the limbo that is elongated in shape and has parallel veins. Wheat flowers are gathered in spikes. Each spike consists of a main axis or rachis on which the spikelets are distributed laterally. These consist of a main axis from which some filaments arise terminated by the glumes that enclose the flowers until they begin to mature. Besides the glumes, flowers are protected by two bracts: the inner is called palea and the outer is called lemma. The latter is topped with a beard that gives the ear of wheat a feathery appearance. The wheat flowers are not very showy. They do not have petals or sepals. Each female flower consists of an ovary from which two styles emerge, finished with two feathery sticky stigmas each. The male flowers have three stamens that can be gold, green or violet. 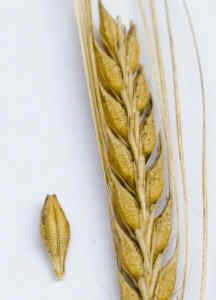 The fertilization and maturation of wheat produces the wheat grain, a fruit of the caryopsis type. – Protective coating or husk: It is the one that protects the grain. Is commonly known as bran. Consists mainly of fiber. It is completely removed when wheat is milled and flour is refined. – External casings: The outer layer is called the pericarp, the central layer or integument mesocarp and the inner layer, epicarp. These layers are mainly composed of minerals, proteins and vitamins, which are assimilated by the body when swallowed whole wheat but they are eliminated in the refining process. – Testa or tegmen, an intermediate layer between the outer casings and the endosperm or albumen. It consists mainly of oils and dyes. – Endosperm or albumen: It is the internal layer of the wheat grain and the one that represents the greater percentage of the whole grain (between the 80 and 90% of the gross weight) Albumen this formed by carbohydrates, such as starch. The function of this part is to provide reserve substances for the growth of the new plant. – Germ: it occupies the bottom of the endosperm. This consists mainly of proteins, oil, enzymes and vitamins of group B. It consists of the radicle (embryonic root) and the plumule (Embryonic leaf) From this part of the grain the new plant is born. A great debate about the origin of wheat has always existed. The consensus view is that the cultivation of this cereal began about 10,000 years ago from wild species harvested by the ancient hunter-gatherers in Southeast Asia. Archaeological remains of wheat bread were found in Turkestan in 6000 BC. In southern Europe, it began to be cultivated in the fourth millennium BC. The Egyptians and Romans cultivated it widely. He was brought to America by Spanish and English. Most of the world wheat production is aimed for feeding. Almost 75% of this production is used for the production of wheat flour. Most of this flour, especially those from soft wheat varieties are used for the production of bread. The flours from hard wheats are used mainly for making cakes, biscuits, etc. In addition to flour, it should be considered that a good proportion of grain is saved for new plantings. A smaller proportion is used for the manufacture of industrial products such as starch, gluten or dextrose. Lower quality grains and by-products of the refining process are also intended for feed industry. Wheat is cultivated in almost all parts of the world. It is the product to which more proportion of arable land is destined. In the year 2000 it was estimated that about 230 million hectares world area were devoted to this crop. China is the largest producer in the world. This is followed by the United States, Russia, Ukraine and France.